Boost productivity by automating and streamlining your business expenses. Our easy to use app transforms the outdated expense reporting process for your employees and finance team. when automating your expense management with Rydoo. Snap a picture of your receipt with your smartphone, submit and control. Track your mileage and claim your travel per diems. Anywhere in the world. Now that you can manage your expenses on-the-go, any dead time can be easily filled with a few quick photos of your receipts. Saving you time is one of the key drivers we have at Rydoo. The days of stuffing receipts in an envelope or drawer to be processed in a weekend are gone. 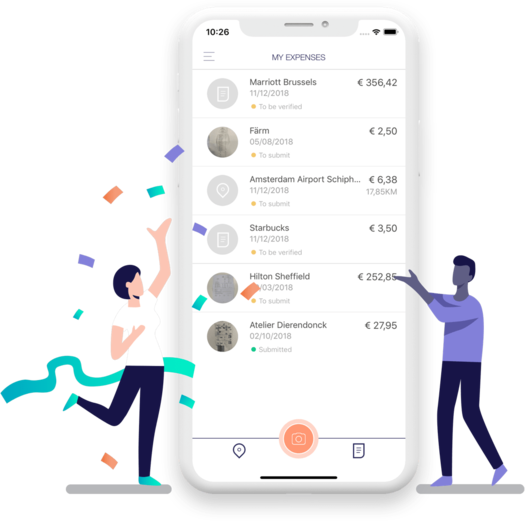 The risk of losing receipts is reduced drastically with Rydoo. The pain that led to you batching receipts once a quarter is no longer there. Cheers to our Customer Success Unicorns! They speak more than 9 languages and they will be by your side to get the best out of the platform. Yes, they are simply amazing. Are you a mid-sized company that is up for a fast onboarding? Our Unicorns can make that happen together with you. For larger companies, our project experts will create the perfect onboarding plan for you. Let our experts double check your expenses and save even more valuable time for your employees. Seven days a week, without any exceptions. I stumbled upon several solutions but with Rydoo, I fell in love - probably because I could instantly see that it was developed with the complexity of our beloved Europe in mind.